Each event has it's own entrance fee and some events are free. If there is nothing listed on a particular day that means there is no special event for that day, but our gallery is open 12-4pm everyday except Monday. 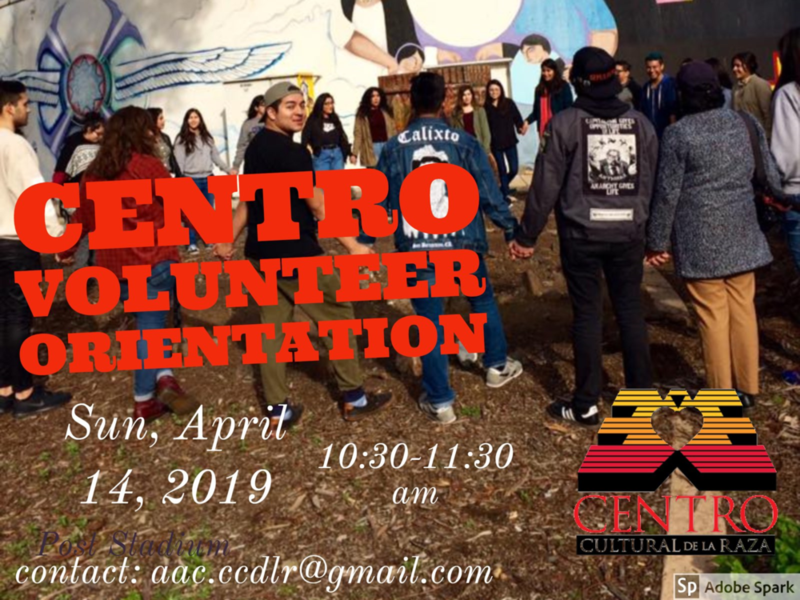 Volunteer Orientation Event organized by the AAC, will be held at the Centro on Sunday April 14, 2019 from 10:30 am to 11:30 am to familiarize current volunteers of the history and tradition of the Centro. Please contact us at aac.ccdlr@gmail.com for more information on attending the event or becoming a future volunteer at the Centro Cultural De La Raza. Tianguis de la Raza to be held April 28th, 2019! Movie night at the Centro, this flyer is for multiple events, the first being April 5th 2019! Parking: Parking at Centro will be for loading and unloading. There is a parking lot across the street that should have plenty of space. Street parking in the area might be difficult on a Sunday. The most precious belonging of a Syrian child is a box, which is used for various purposes such as a toy, a home and a boat respectively. The deported musician José Márquez and his daughter Susana have been separated for almost 15 years, but meet every month on both sides of the US-Mexico border wall. The life of Yuli, a Haitian woman who lives in the Dominican Republic for more than 35 years, has been a permanent struggle to raise her own with dignity despite the precarious immigration status with which she has lived ever since. The son who caused Yuli to cross the border at the beginning of the 1980s, returns and finds his mother who, after all that time, is trying to fix her situation given the regularization plan that the Dominican government has put in place. But what is it that really makes us belong to a place? How are the links with a territory and its people generated? For a body that migrates, a cartography. Draw a map of ours, the body that travels. A map that accounts for these battles, the many. Let the blood travel, until you reach the earth that is no longer root. A map that gives an account of the slave hands that we are, that they hold, without even knowing which one of all the empires. A map that stops exiling us and receives us and no longer expel us. A map that takes us home. Las Patronas is a group of women known for cooking for migrants who pass by trains through La Patrona, Veracruz (Mexico). His sense of solidarity is premised on human integrity. Their kitchen is a political space in which they learned to talk about the problems of the country and take the solutions in their hands. Invitación abierta a talleres gratuitos presentado por V Censurados Film Festival en Centro Cultural de la Raza, Sábado 19 de mayo a partir de las 3:00 p.m. a las 6:00 p.m.
* Estas películas y talleres son gratuitos para la comunidad. * Después una serie de películas sábado y domingo 18-19 @7pm. La pertenencia más preciada de un niño sirio es una caja, que se utiliza para diversos fines como un juguete, un hogar y un barco respectivamente. El músico deportado José Márquez y su hija Susana han estado separados durante casi 15 años, pero se reúnen cada mes a ambos lados del muro de la frontera entre Estados Unidos y México. La vida de Yuli, una mujer haitiana que vive en República dominicana hace más de 35 años, ha sido una lucha permanente por criar a los suyos con dignidad pese al precario estatus migratorio con el que ha vivido desde entonces. El hijo que provocó que Yuli cruzara la frontera a principio de los años 80, regresa y encuentra a su madre que, después de todo ese tiempo, está intentando arreglar su situación dado el Plan de regularización que el gobierno dominicano ha puesto en marcha. Pero, ¿qué es lo que nos hace realmente pertenecer a un lugar? ¿cómo se generan los vínculos con un territorio y sus gentes? Para un cuerpo que migra, una cartografía. Trazar un mapa nuestro, el cuerpo que viaja. Un mapa que dé cuenta de estas batallas, las tantas. Que recorra la sangre, hasta llegar a la tierra que ya no es raíz. Una mapa que dé cuenta de las manos esclavas que somos, que sostienen, sin siquiera saber qué cuál de todos los imperios. Un mapa que deje de exiliarse y nos reciba y ya no nos expulse. Un mapa que nos lleve a casa.